Is it snowing in Kobla ?¡Gracias! Kobla is now closed (discovered on visiting the area during February 2014). The ski area needs financial assistance to operate once again. 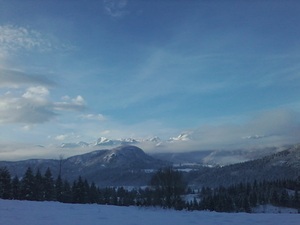 Kobla provides 23km of low altitude skiing at Bohinjska Bistrica in the north-west corner of Slovenia, NW of Ljubljana. Kobla is mainly a beginner to intermediate level resort with pistes on wooded slopes. There are 6 lifts at Kobla and extensive snow making. The longest piste is 6km and falls by a respectable 940m. Kobla is the only Slovenian ski resort accessible directly by train. This Ski resort is very friendly, with a relaxed feel with good skiing for the whole family. Kobla Generaly is open from 20th December thru to mid March. Long fast runs for Intermediate and Expert also good beginer slopes and tracks. Present skiing conditions very good, all slopes are open. Kobla is and probably remains to be closed for a few years onward because the leader of the project supposably has some financial problems. The future of the 2864 resort, therefore, remains uncertain. But there is a good side to this because Kobla now offers awesome free skiing grounds! When the snow is high there is nothing better than waving in the powder there! The skiing trip can be extended from nearby Soriška Planina through the mid mountain peaks to the top of Kobla and if there is enough snow one can easily get directly into Bohinj valley.